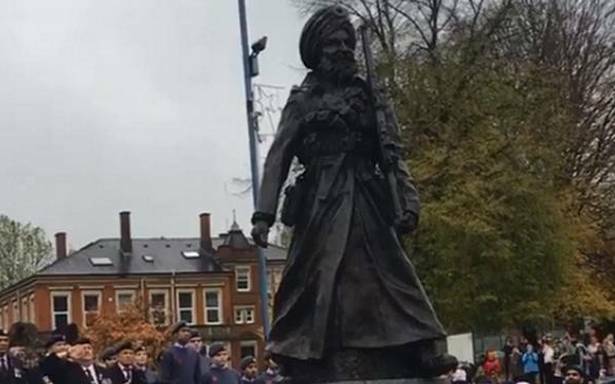 A sculpture in honour of Indian soldiers who fought during the First World War was unveiled on Sunday in the town of Smethwick in the West Midlands region of England on Sunday. Guru Nanak Gurdwara Smethwick had commissioned the Lions of the Great War monument, which depicts a turbaned Sikh soldier, to honour the sacrifices made by millions of South Asian service personnel of all faiths who fought for Britain in the world wars and other conflicts as part of the British Indian Army. “We are very proud to be bringing this memorial to honour the sacrifice of brave men who travelled thousands of miles to fight for a country that wasn’t their own,” said Jatinder Singh, president of Guru Nanak Gurdwara Smethwick. The 10-foot bronze statue was unveiled in Smethwick High Street to commemorate the 100th anniversary of the end of the First World War in November 1918, also referred to as the Great War. The monument was part of a collaboration between the gurdwara and the local Sandwell Council. “It’s so important we remember the sacrifices made by people for our country, said Councillor Steve Eling,” Leader of Sandwell Council. “When I realised more than 1.5 million Indian soldiers had been sent to the First World War, I just could not understand why their contribution had been ignored for so long in this country,” said Like Perry, the artist who designed the statue.